Watch this new video from BCTV with our founder Anthony Giangiacomo. Shady Hollow Assisted Riding is a non-profit organization incorporated in 1998. We provide a supportive equine environment where individuals with physical, cognitive and/or emotional challenges can experience therapeutic, social and educational rewards. As a non-profit we rely greatly on donations and support from our community. We appreciate any and all donations. Listed below are examples of how you can help. Shady Hollow Farm has horse boarding available for a monthly fee. Full board includes: private stall, grain feeding twice daily and hay 3 times daily. Daily turn out into private paddocks or group paddocks. Grass pastures are open late spring, summer and early fall, weather permitting. Worming is also included. - Ride or Drive Scavenger Hunt on April 14, 2019! - Congratulations to everyone who participated in our latest golf fundraiser. A great success! 2019 date coming soon. Ease into a Summer Camp routine for you and your child. The first year at camp can be a challenging transition, we make the process easier by offering a half day program for ages 5-9 years old. Camp begins at 9 am and ends at 1 pm, Tuesday through Friday. Are you kids wound up after all the holiday festivities? We know a great way to get them centered and relaxed... by spending the morning on the farm with our horses! Our service-learning (S-L) program uses horses to teach life skills; practical and interpersonal. Students participate in horse care, barn management, and farm maintenance. Social and Emotional Learning (SEL)* curriculum is fueled by psycho-educational sessions of Equine Assisted Learning (EAL). Service-learning is an opportunity to translate learned skills into behavior and action. Able Body Lessons - For individuals without special needs, we have both Group Lessons and Private Lessons at Shady Hollow. Our lessons are for beginning and intermediate riders and taught by our experienced instructors. Assisted Riding - Assisted Horseback Riding Lessons are available for individuals with physical, emotional or psychological special needs. It’s a wonderful opportunity for exceptional people who are looking for an outdoor experience. Beginner Rider Lesson Packages - Packages are a great way to get some experience without a huge financial commitment. Beginner lessons are (1) hour lessons and taught by one of our Junior or Apprentice Instructors. 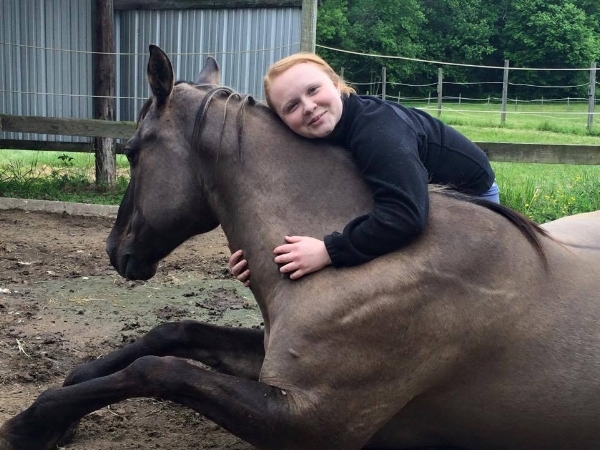 When was the last time you helped someone hug a horse? At Shady Hollow Farm in Birdsboro, we provide an equine experience for people living with emotional, physical and psychological needs. Volunteers are the backbone of our organization! Program Volunteers are required to attend a 3 hour training course prior to assisting with lessons. Training courses are offered monthly through out the year. To register for a course, please contact us or call 610-582-4050.